Is COOLIEF* covered by Medicare? COOLIEF* may be covered by Medicare and by certain private payers. However, your doctor will need to confirm with your insurance provider if they cover the COOLIEF* procedure. How does the COOLIEF* procedure work? A radiofrequency generator transmits a small current of RF energy through an insulated electrode, or probe, placed within tissue. Ionic heating, produced by the friction of charged molecules, thermally deactivates the nerves responsible for sending pain signals to the brain. What should I expect after the COOLIEF* procedure? COOLIEF* is a viable option for many patients who aren’t ready or eligible for surgery. 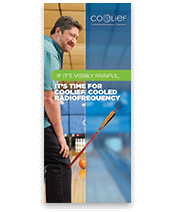 Compared to steroid injections, COOLIEF* has demonstrated improved pain relief, functionality, and patient satisfaction. A short procedure can help you return to normal activities within a week or two. Follow your physician’s discharge instructions after the COOLIEF* procedure. Consult your physician to understand the risks and potential contraindications for this procedure. Potential complications associated with the use of this device include, but are not limited to, infection, nerve damage, increased pain, visceral injury, failure of technique, paralysis, and death. Chronic pain is different than regular pain. Usually the pain signal stops when the cause is resolved — for example, your body repairs the wound on your finger or your torn muscle. But with chronic pain, the nerve signals keep firing even after you’ve healed. Your body keeps hurting weeks, months, or even years after the injury. Doctors often define chronic pain as any pain that lasts for 3 to 6 months or more. Not sure if you’re ready for COOLIEF*? Talk with your primary physician using this guide. Find out more about OA knee pain and if COOLIEF* may be right for you. Knee pain can be caused by several things, such as bone spurs, cartilage fragments in meniscus fluid, or worn-away cartilage. Back pain is one of the most common medical problems in the US. Acute pain is the most common type of back pain and lasts no longer than 6 weeks. Chronic pain can come on quickly or slowly and lasts a long time, generally longer than 3 months. Back pain is a symptom of a medical condition. It can get better even if you do not know the cause. 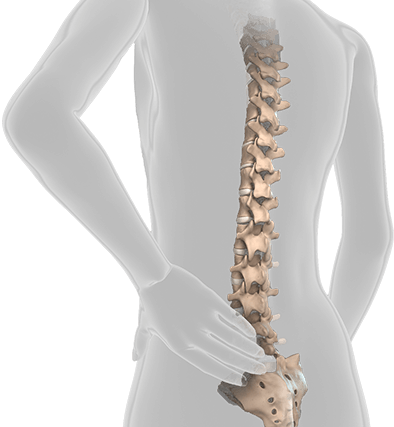 Chronic back pain can occur in one or several locations of the back, including the cervical, thoracic, or lumbar areas. Speak with your doctor to identify the location of the pain and how to treat it. There are COOLIEF*-trained specialists all across the country. Interested in an appointment? Kapural L, Nageeb F, Kapural M, et al. 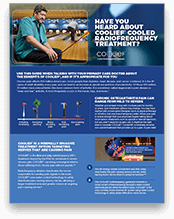 Cooled radiofrequency (RF) system for the treatment of chronic pain from sacroiliitis: The first case-series. Pain Pract. 2008;8:348-354. Pauza K. Cadaveric intervertebral disc temperature mapping during disc biacuplasty. Pain Physician. 2008;11:669-676. Kapural L, Hicks D, Mekhail N, et al. Histological changes and temperature distribution studies of a novel bipolar radiofrequency heating system in degenerate and nondegenerate human cadaver lumbar discs. Pain Med.2008;9:68-75. Petersohn JD, Conquergood LR, Leung M. Acute histologic effects and thermal distribution profile of disc biacuplasty using a novel water-cooled bipolar electrode system in an in vivo porcine model. Pain Med.2008;9:26-32. Gupta A. Evidence-based review of RF ablation techniques for chronic sacroiliac joint pain. Pain Med News. 2010;1-8. Kapural L. Intervertebral disc cooled bipolar radiofrequency (intradiskal biacuplasty) for the treatment of lumbar discogenic pain: a 12-month follow-up of the pilot study. Pain Med. 2008; 9:407-408.